Keep your mind focused and your memory sharp. If you love learning, Carolina Meadows has plenty of options for you to expand your knowledge in new areas or to share your expertise with fellow residents. The resident-run library is a perfect spot to read current newspapers and magazines. 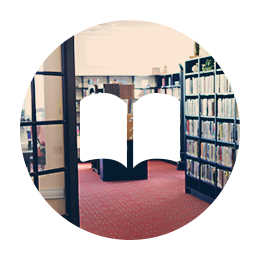 Our library also houses a diverse selection of books for enrichment and entertainment and more than 700 DVDs. Make reading a social experience by checking out the Book Group’s latest selection and join in on the conversation. 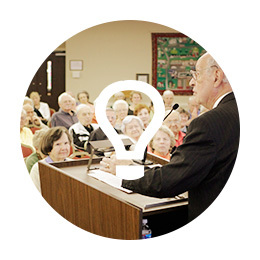 If you’re an auditory learner there are plenty of lecture series to keep your brain active, including our wildly popular weekly World Affairs presentation and discussion. Short learning courses are provided by Carolina Meadows University with lecturers from UNC, NPR and residents with academic backgrounds. Carolina Meadows also hosts the University Speakers series six times each year. Administrators and faculty from UNC-Chapel Hill and other universities within the Triangle present interesting and informative lectures about diverse topics. CMU was created several years ago as a way to keep our residents informed about and engaged in many areas of interest. The initial committee developed a series of diverse programs led by instructors who have a real passion for their subject matter and can share that passion with participants. Program formats may include lectures, discussions, short-format opportunities that require minimal preparation and others that allow for deep dives into a particular area. There are also plenty of chances to go out into the community to learn. Take a course or attend a lecture at the Friday Center or go to an event at the Wilson Library on UNC’s campus. Courses are available at the Osher Lifelong Learning Institute at Duke University, too. We encourage our residents to explore the local community and take advantage of all learning opportunities.